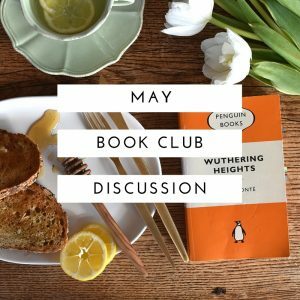 Let’s discuss Wuthering Heights! Read through my discussion prompts below, then add your thoughts on those or anything else you felt was important to you. If you have written a review please include a link to it, and ask a question for me (or other book club buddies) to answer. And remember to check back to see if people have replied to your comments. I found all the characters in Wuthering Heights to be wicked or contemptible in some way. Even Nelly the sometimes narrator, who could have been portrayed as a kindly, sympathetic character is responsible for treating other characters awfully. To me though this was all part of the appeal! It sounds strange to enjoy a book so much where you can’t possibly like a single character, but there is something so wonderfully invigorating about reading a novel where the author has so deliberately set our to expose all the worse parts of humanity. Throughout the book things seem to exist in pairs, what do you make of that? Do you think it has a special significance? And did you find it confusing? There are two Catherines, two Heathcliffs, two houses (Thrushcross Grange and Wuthering Heights), two families (Earnshaw and Linton), and even two halves to the novel. I found the names endlessly confusing, and on the advice from someone on instagram looked up a family tree. After shouting that the English should stop marrying their cousins, I did stop and think about the significance of all these pairs and of how interlinked all the elements of the story are. All these sets of pairs give the novel a claustrophobic feeling, and drive the tension in the inter-personal dramas. The only character to ever leave the limited setting of Grange and Heights dies ‘off screen’ once again adding to the possessive hold that novel has on physical space. I was also fascinated by how the second generation echoes the personality and failings of the first generation, which gave the novel a poetic feeling. Heathcliff: Figure of wickedness or romance? Heathcliff seems to be widely regarded as a classic example of the ‘tortured romantic hero’ archetype. I’m honestly not sure that I agree with that, and I’m curious to see what you all think. Though he is fascinating as a character so deeply invested in long term revenge (even after the death of those who inflicted pain upon him), I didn’t find him to be a romantic character. It just so perfectly illustrates the circular nature of the story and the excess of emotion that it contains. Though I will wait to write my review after I have read all your discussion points (for your options may sway me into new interpretations) my first reaction is that I am very glad I read this book. Review is up, and can be read here. It is one that I have heard mentioned and referred to so many times, but I didn’t imagine that it was such a dark and complex book. The more I think about it the more clever this book appears to be. Emily Bronte might have only written one novel, but it is certainly a fascinating one! For now I am tentatively giving it 4.5 stars. I liked Nelly because I feel like she said what possibly a lot of readers were thinking. The “don’t do that!” sentiment. I didn’t find Heathcliff romantic. I sympathized with his younger self, but not at all with his older self. I’m not sure I have a favorite quote. If I did it might be pretty scenery description. Here’s my review. 😀 I gave 3/5 stars. One of my questions would be, what inspired Emily to write such an epic revenge drama? I’m sure google could give a lot of reasons and speculations, but maybe good for discussion. I really liked your review! Thanks for linking to it. I feel like many people will be torn between hatred of the characters and being impressed with the literary merit of the story. For me, I don’t mind that all/most of the characters are awful, I think it just shows a writer who was so determined to write either what she saw of the world, or what she saw that was missing from novels in her time. I don’t know anything about the Bronte sisters except that Emily only wrote the one novel, they had quite a lonely and sheltered upbringing, and that Charlotte’s Jane Eyre (while not as filled with awful people) is similarly dark. You ask a brilliant question in ‘what inspired her to write a novel like this?’ And I might have to do some research before the video! I adored Heathcliff despite him being an awful person; as I adore Clare’s Sebastian. They’re both awful human beings but they both experienced awful childhoods, and while I am not trying to excuse the awful things they’ve done, I can’t help but love them. I didn’t get confused with the pair of Cathy and Heathcliff’s (except when talking about the book), I always assumed their significance was meant to compare and contrast the two sets of generation and what time does to bitterness. Heathcliff is both, without his romantic feelings for Cathy #1, the story could not exist. He was meant to demonstrate the danger of an abusive relation and the dependency they held on each other, that even in death they’d haunt each other. My favorite quote is “whatever our souls are made of, his and mine are the same” or “Be with me always— take any form— drive me mad! Only do not leave me in this abyss, where I cannot find you!” There are probably others but I haven’t read the book in almost three years. I love WH, it’s probably my favorite classic next to Pride and Prejudice. I have to reread it this summer, and I might have to do a review as well. Thanks so much for sharing your thoughts, it’s so interesting to hear from someone who loves the book for such different reasons to me. You make a great point that it is the love between Heathcliff and Catherine which fuels the novel, without it there is no conflict. And it is the corruption and twisting of that love that makes the book so much darker than novels like Pride & Prejudice! Fascinating! I think for me Nelly is the reason I could bear to read this, because she provides some sort of moral standpoint to view the story and characters from – I know she is not perfect either, but she always acts after what she believes is best, and that cannot be said about many of the other characters. Especially Heathcliff! I am also glad that you mentioned the Heathcliff-as-a-romantic-figure issue, because that’s what’s been bothering me a lot… Before reading this book, all I knew about it were the quotes people often share, and most often the ‘his and mine are the same’ quote abounds. I view that as a bit problematic, because this quote seems to romanticise both Catherine’s and Heathcliff’s behaviour and their relationship, and I see none – absolutely none – of their actions as romantic, and not their relationship either. Possessive, manic, vengeful, yes. But romantic, no. And even if Heathcliff’s love could be perceived as somewhat romantic before Catherine’s death, it sure wasn’t after. How he sets out to ruin the lives of so many people, and for what? He seems to indicate that he wants Trushcross Grange as his property and that’s what he uses his son to achieve, but when he has it he cares nothing for it. Except getting rent, which is fine, but he seemed pretty rich before that anyway. If his love for Catherine had somehow made him a better person, then I could understand the romantic view – but this love only makes him more despicable. In fact, he is now on the top of my list of villains, cause in my view he is one. In general I enjoy how the story really emphasises how much influence our upbringing has on our personalities. Heathcliff, Hindley, Hareton and Linton’s personalities are obvious in their very ruthless and abusive upbringing, but even young Catherine, who was brought up with love and no falsehoods and evil intents, shows how this sort of upbringing can lead to one’s demise as well – because of this upbringing, she doesn’t recognise the malice and motives of Heathcliff and Linton in time, and thus is set for destruction. I definitely agree with you that I had seen the declarations of love as quotes and assumed that this was going to be a sappy romantic tale, not a tortured tale of bitterness. Heathcliff was not at ALL what I expected, but I think that I enjoyed the book more for that. I also love you point about Cathy: “she doesn’t recognise the malice and motives of Heathcliff and Linton in time, and thus is set for destruction.” This is so true, and really shows Bronte’s interest in how our upbringing shapes our actions as an adult. I am glad that she managed to move on from her prejudice against Hareton and be less selfish in a way in which her mother could not. The second generation managed to swallow their pride, and not end up tortured. This book! I read it a few months ago and I’m still torn in my rating of it and feelings for it! Is that a sign of a good book? I liked it, but didn’t love it. I despised every single character. So much so that I did a fist pump in the air when Heathcliff had died (that was the moment Tamsien! Lol). But if that was Emily Bronte’s intention then the book is a triumph – it shows the bitter, heartless and calculating parts of human nature in its truest form. Heathcliff was in no way a romantic figure for me. He was selfish, bitter, jealous, cowardly and vicious. He had no redeeming qualities. In the little we saw of Cathy #1 (in comparison to the length of the book), she was no better. So, they were made for each other if you want to look at it romantically, but it wasn’t a healthy relationship. Cathy #2 was almost a redeeming character who I could almost like, but not quite. My favourite quote comes from her: “…you have nobody to love you; and, however miserable you make us, we shall still have revenge of thinking that your cruelty rises from your greater misery! You are miserable, are you not? Lonely, like the devil, and envious like him? Nobody loves you – nobody will cry for you, when you die!” I could’ve high fived her here! I gave the book 3 stars. But I’m still thinking about it so that could change and go up. Thanks for sharing your thoughts Steph, I did wonder if that was your ‘fist pump’ moment! I love that quote from Cathy, I think she shows real fire and stands up to Heathcliff (eventually) which I admired, though it was hard to love her with all her other flaws. I quite liked Hareton in the end. I think he conducted himself well despite how bitter he had every right to be, but I don’t think he was the kind of character that I could really love either! In terms of Bronte’s intentions, in the live discussion Corrinna uncovred some of the family history behind the tale, and for me that really elevated the story. It showed that she was not just interested in plumbing the depths of horrible personality traits, but that she was exploring her own past and relating it to her experience of the world. Sadly that was not an altogether pleasant experience! This is a reread for me so I had a decent base knowledge coming on when it comes to the confusion about the names and family tree. I still found it helpful to have a family tree, which was included in my copy of the book. I’d like to talk about the romantic aspect of the novel, do you consider this a “romantic book”? First thing, I believe that there is a distinction between romance novels and romantic literature. Romance genre focuses on the relationship and love (all that mushy stuff), while romantic literature, to me at least, refers to a prose narrative or colourful, deep, metaphorical language that focuses on a combination of the scenery, feelings, or relationships. So by this logic, I would say that this book falls in the literary romance category. But by no mean do I think Heathcliff is a “loving” romantic but he is a romantic in that he is headstrong in his affections for Catherine (#1) and that this affection plagues him, putting his feelings for Catherine at the upmost importance, even more so than the lives and relationships of those livid around him. I’m still uncertain about my rating, debating between 3 to 4.5 stars. The characters are hard to like, intentionally so, but it makes it hard to rate the book because one of my major criteria for a higher rating is how I relate to the characters. Thanks for sharing your thoughts Mya! I like your perspective on the romance vs romantic novel. I have a similar distinction in my head, though I would have labelled the literary romance as novels concerned primarily with exploring love, rather than the style of prose (which I think is also a factor but not a main one). To me Wuthering Heights is more about pride and revenge than it is about love, but I do think that without the ‘love’ between Heathcliff and Catherine there is no story, so I could definitely be swayed in your direction! It seems it is a very hard book for many people to rate! My appreciation for the structure and literary merit lent me towards a 4.5 star rating, but I am not strict in applying criteria for my ratings, rather working on how they make me feel.